From Evenings with Audubon lectures to monarch tagging, join us! We'll have several birding stations set up along the way, with helpful volunteers. You can stop, take a peek through a spotting scope, and learn something new. When you're done birding and biking, the route brings you right back to Capital Brewery, where we'll have a cold one, a band, and lots of fun waiting for you! *No pressure, no rush. Enjoy the ride, and know that birders of ALL skill levels are welcome. Even if you don't consider yourself a birder, we guarantee you'll have fun (and there's good beer involved). One free cold one at Capital Brewery after you've completed the loop! Super soft Birds, Bikes, & Brews t-shirts are available to purchase! Buy one with your registration by September 1 and pay just $15! Shirts will be $20 on the day of the event (size, color, and cut selection will be limited). Shirts will go on sale when registration opens. No, it's not necessary! Feel free to save a tree - just tell us your name when you arrive at the event. We'll know what ticket type you registered with. All attendees must bring their ID to enter Brewery grounds. Minors will be given a special drink ticket. If you're close enough to bike, by all means, come on two wheels! Otherwise, there's parking at Capital Brewery’s parking lot, and street parking all around. You can call or email Brenna, MAS communications director, at 608-255-2473 or bmarsicek@madisonaudubon.org. We’re sorry, this event has been cancelled due to a conflict in the presenter’s schedule. Whether the American Robin is making its leisurely way from Illinois wintering grounds or a Bobolink is making its cross-hemispherical journey from Argentina to Wisconsin, both trips require a sense of direction. Orientation and navigation skills beyond those of Sacagawea, Merriwether Lewis, and William Clark are needed for these aerial treks. Come hang out with the Friends of the Pheasant Branch Conservancy and learn the many ways we think birds are able to complete the wonder of migration. Abe Lenoch, one of Madison Audubon’s wonderful volunteers, will present this talk to the Friends of Pheasant Branch Conservancy’s “Conservancy Days” series. Free and open to the public. Climate change is impacting life at all latitudes, with increasing temperature in the Arctic affecting polar bear habitat and populationsin novel ways. I will share with you how climate change, specifically sea ice dynamics, is putting this flagship species at risk. Using data collected over the last 35 years, my research aims to better understand how a changing climate influences polar bear health in the southern Beaufort Sea. Free and open to the public. This talk is hosted at the VFW Post 1318, also known as Cranefield's (133 E. Lakeside St.), just off of John Nolan Drive. Food and drinks are available at the bar for those who hope to catch dinner before or after the program. Tricia is a PhD student in the School of Veterinary Medicine at UW. She is a Wisconsin native and got her start in wildlife ecology as an intern at the International Crane Foundation. After earning an M.S. in Wildlife Ecology from UW in 2004, she worked as part of the Wisconsin DNR Wildlife Health Team on chronic wasting disease and West Nile Virus. Tricia spent 8 years working for the USDA at the National Wildlife Research Center in Fort Collins, Colorado where her research on focused on prominent wildlife diseases including rabies, avian influenza, and chronic wasting disease. Prior to starting her PhD program, Tricia taught Ecology at UW. Each spring and fall in the Madison area is a special time in so many ways. One reason is that we are fortunate to witness firsthand one of the most awe-inspiring and captivating phenomena in the natural world. Local elections. Wait, no… definitely not that. I’m referring, of course, to the arrival and departure of Wisconsin’s splendiferous migrating birds. Twice each year, the land, air, and water are abuzz with wandering warblers, flitting flycatchers, sojourning swans, and roaming raptors. These and other amazing birds are in the midst of an arduous annual journey, often traveling many thousands of miles in search of quality feeding, roosting, or breeding spots. Bird migration has both entranced and perplexed us for at least as long as we’ve been recording our history. In order to explain the annual vanishing of common redstarts and the appearance of European robins, for example, Aristotle speculated that each redstart simply transformed itself into a robin in winter. Not to be outdone, 17th-century English minister and scientist Charles Morton claimed that birds simply migrated to the moon and back each year. Lunacy. Thankfully, many years of careful observation, research, and advancement in technologies have shed light on the mysteries of bird migration and revealed its marvelous nature. Why do birds undertake such daunting journeys? How do they manage to navigate over such extensive distances? How do they survive such a taxing physical effort and the many perils they face along the way? If you’ve ever spied a beautiful bird at the Preserve and pondered these and similar questions, this talk on the science and splendor of avian migration might just be for you. Madison's lakes are in need of home owners and community members to take action and take care of them... from their own yards! John Shillinglaw will describe how folks can participate in protecting the Madison area watersheds by adding to habitat for pollinators, and provide ideas for ways you can make a real difference simply by managing your yard in watershed-friendly ways! Native gardening, composting, leaf management, and more. Plus, your watershed-friendly yard will look great and attracts lots of fun insects, birds, and other wildlife. John Shillinglaw is a retired ophthalmologist and moved to Madison in 2013. He has been an Audubon member for 45 years and was active with the Fox River Valley Audubon Society. He is a restoration biologist with a special interest in dry prairies. Hobbies include birdwatching, paddling, biking, fly fishing and hiking. He has been a Madison Audubon board member since 2017, and is especially interested in Madison Audubon's education programs. Do something big for birds! The Big Share is a day of online giving for over 70 non-profit organizations in Wisconsin, all working on environmental and social justice. Madison Audubon is a proud member, and we encourage you to share your love for your local non-profits on this day of joy and sharing! To donate, visit our Big Share fundraising page. Thank you for caring about birds, habitats, and kids in Wisconsin! What does it take to monitor kestrel boxes and why do we do it? American Kestrel numbers have been dropping dramatically over the past 40 years, especially in the Northeast & Eastern Canada and the decline has reached the Midwest as well. MAS has responded by putting up a network of boxes. This program will cover the plight of the American Kestrel and what volunteers for Madison Audubon are doing to help keep their numbers up in south-central Wisconsin. Patrick Ready lives in Madison, WI and was a Back Yard Nature Specialist for the Wild Birds Unlimited store (retired). He has been the president of the Bluebird Restoration Assoc. of WI (BRAW) for the past 4 years. He maintains 6 bluebird trails in Dane County and has been monitoring nest boxes since 1999. He is also the editor of the Wisconsin Bluebird, the quarterly newsletter for BRAW. The past four years he has been involved with American Kestrel nest box monitoring for Madison Audubon in south-central Dane Co. He enjoys bird watching, photography, and kayaking in his spare time. This trip was originally scheduled for January 23, but postponed due to snow. The new date for the trip is February 13. A behind-the-scenes tour of the bird collections: learn about the more than 500,000 museum specimens and get a hands-on look at bird study skins, eggs, and more. Tour the Bird Lab and meet the Museum scientists and volunteers, and explore fascinating experiments-in-progress, including flesh eating beetle projects! An example of the incredible artwork done at the Field Museum Bird Lab by Peggy Macnamara. In addition to these amazing tours that are not offered to the general public, participants will have the afternoon to explore the rest of the museum with a special access pass. This pass includes admission into all of the permanent and premium exhibits at the museum, not including the 3-D theater. Transportation to and from the Field Museum will be provided by Madison Audubon Society and is included in the cost of the trip. A bus will depart the Dutch Mill Park & Ride at 7 a.m. sharp on Wednesday, February 13. Cost covers transportation, behind-the-scenes tour (NOT AVAILABLE TO THE GENERAL PUBLIC), exclusive presentations by museum staff, a museum special access pass (normally $38 per person), and a small donation to the Bird Lab at the Field Museum. Registration is now open to Audubon members and the public. The Christmas Bird Count, now in it's 119th year, is an annual citizen science event in which birders all over the country spend one day searching for their feathered friends. The goal is to take a snapshot of the bird landscape throughout North America. The data collected by volunteer birders and turned into the National Audubon Society help scientists understand bird population trends. Plus, it gets you out birding in the beautiful (or sometimes blustery) winter weather! Madison's Christmas Bird Count survey area is so large that we divide it up into 23 areas. Each area has an experienced captain leading the survey for their part of Madison, Middleton, Verona, McFarland, Fitchburg, Cottage Grove, Sun Prairie, Waunakee, or DeForest. Start- and end-times and survey locations vary by area. You can either join us in the field to count birds, or stay home and watch your bird feeders. Or both! To get involved, visit madisonaudubon.org/cbc and sign up. We will work with you to find a person leading a counting group in your area. Madison-local, author, and professor Steven Davis will present the arguments he makes in his recently published book, In Defense of Public Lands, which advocates that public land should remain in the public's hand, despite debate over whether these lands should be privatized. He will discuss the empirical data and theoretical arguments from biological, economic, and political perspectives in order to build a case for why our public lands are an invaluable and irreplaceable asset for the American people. Note that this Evenings with Audubon will be a week earlier than our usual schedule, due to Thanksgiving the following week. Birds, Bikes, & Brews combines three of our favorite things in one awesome event! Join us to BIKE around Lake Monona, BIRD as you go, and enjoy a cold BREW after your ride at Next Door Brewing Company! When you're done birding and biking, the Lake Loop brings you right back to Next Door Brewing, where we'll have a cold one waiting for you! One free cold one at Next Door Brewing Co. after you've completed the loop! If you're close enough to bike, by all means, come on two wheels! Otherwise, there's parking at Next Door Brewing Company's parking lot, and all along Atwood Avenue and neighboring streets. Cost is $10 for adults, $5 for children, and there is a limit of 6 tickets per group. You can register for one of the two: morning (9:30-12:00) and afternoon (1:30-4:00). Registration is now open to the public! But if you're interested in joining Madison Audubon, you can do so by clicking here or by including a $20 donation in your ticket purchase. Note that you must attend the session you register for. Native bees are a wildly diverse and important group of animals -- numbering in the hundreds of species just in Wisconsin alone! Christy Stewart from the University of Wisconsin-Madison will kick off our fall Evenings with Audubon series with a presentation that opens your eyes to the beauty, variety, and significance of these little pollinators. 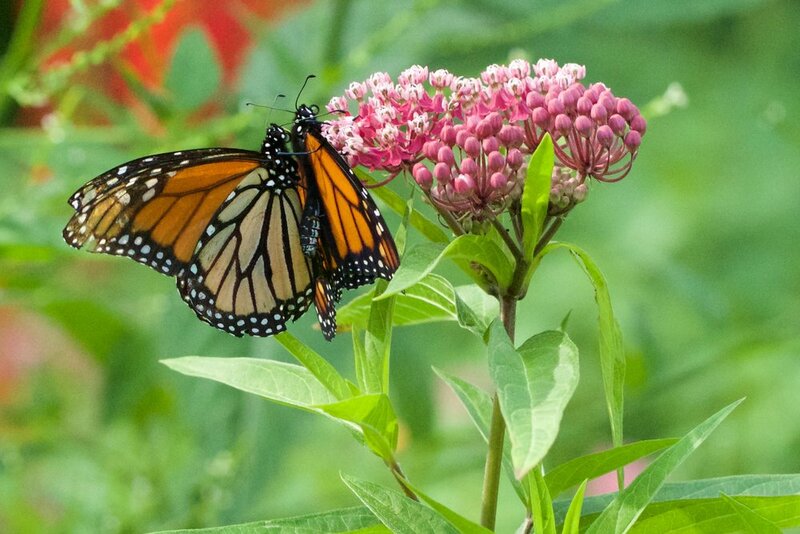 The annual Goose Pond Sanctuary Butterfly Count will be held on Monday, July 2, 2018! This count is part of the Mud Lake National Butterfly Count, and is one piece of a network of counts held throughout the country to document the diversity and abundance of our scaly-winged friends each year. Celebrate Goose Pond's 50th anniversary by participating in this fun, memorable event! All are welcome to participate and butterfly identification expertise is not required. We will provide you with resources (nets, guides, etc.) that will help you with the count. Meet at the MAS Goose Pond Sanctuary Kampen Road residence (W7503 Kampen Road, Arlington) at 9:00 a.m. We will divide into teams and count butterflies till noon, then we will head out for lunch and back at it after lunch till 4:00 p.m.
Join us in a celebration of birds, habitat restoration, and what they mean to the heart with a presentation by Laura Erickson, who created Goose Pond's first bird list (223 species!) in 1978. Laura Erickson, author 11 books about birds, and is a Science Editor at Cornell Lab of Ornithology, columnist and editor for BirdWatching magazine, and host/producer of "For the Birds" radio program. Join us for our April Evenings with Audubon, focusing on the wonderful chimney swift, due back in the state around this time. Sandy Schwab, a key player in the Wisconsin Chimney Swifts Working Group, will share information about the natural history, migrations, threats, and conservation tactics relating to these fascinating birds. It’s fun to observe birds, but knowing exactly what you’re looking or listening for is often the biggest challenge for beginning birders. Madison Audubon is partnering with Madison Parks to bring Learn to Birdwatch to Elver Park. MAS volunteer Abe Lenoch will provide hands-on instruction on how to use binoculars, identifying common birds, what migration is and why birds do it, best birdwatching times and locations and more. All ages are welcome. A limited number of binoculars will be available for use so please bring your own binoculars if possible. The devastating bat disease white-nose syndrome (WNS) was first detected in Wisconsin in 2014 and now it’s spread throughout the state, affecting almost all caves and mines. The Wisconsin Bat Program has been tracking the steep population decline occurring since and searching for remaining individuals. Join DNR bat biologist and state cave & mine specialist Jennifer Redell for Evenings with Audubon. You’ll be introduced to the amazing but secret lives of your neighborhood bats and will hear the story of WNS in Wisconsin. Jennifer will be accompanied by live bat ambassadors and will share a variety of actions you can take to help Wisconsin’s bats. This talk is hosted at the VFW Post 1318, also known as Cranefield's (133 E. Lakeside St.), just off of John Nolan Drive. Food and drinks are available at the bar for those who hope to catch dinner before or after the program. Join us for coffee, cookies, and bird chats on March 6, 11am-1pm at the Wild Birds Unlimited store. Madison Audubon will be on-site to talk with you about birds, habitat restoration, citizen science, and more, while you get all of your bird feeding and watching swag in the store. Plus: you can help Madison Audubon "Fill the Feeder" with donations -- big or small -- during those 2 hours. No matter how much you donate, will get you a coupon for in-store shopping and be entered into a raffle. See you then!